In general, it’s a pleasant stay. But walking to the restaurant under the strong sunshine and high temperature is a little too much for the elderly and the people who can not take the heat. AMAZING STAY! I’m celebrating my birthday and the staff was exceptional! They went out of their way to make sure I had the best birthday ever. The room was clean and absolutely gorgeous. Breakfast was wonderful. The only drawback was that when I booked the room I was told that I get a discount off of spa services. I booked a spa service and showed them my reservation and they told me I was not able to use my discount because it was for a la carte only. That was disappointing but otherwise I had a great stay. This was a truly amazing hotel! Room was excellent and the infinity pool on the balcony exceeded our expectations! We had a couple of minor issues that the staff responded to and fixed immediately. The breakfast buffet was outstanding! View from the room spectacular! Fantasea & James Bond island awesome! Infinity bar sunsets spectacular! The staff was remarkable (super sweet, courteous, and professional)! Can’t say enough good things about the Grand Wyndham Kalim!!!!!!! The amenities are spread out too far and hard to navigate. The properties was like a ghost town. You won’t see any other guest until you go to eat breakfast and dinner. It’s over an hour ride from the airport. Mosquitoes flying around everywhere in the room. The breakfast and dinner were good. The view was nice from the rooftop pool, and main lobby and dining room. Oh yeah there are 2 lobbies. The main lobby and the lobby for a shuttle. Yeah I just said 2 lobbies. It’s a confusing layout. I have to say WOW!!!!! Money worth in everyway. From booking I contacted the hotel thru orbitz and they were fast to answer back I had a couple of request for my stay and they met every expectation. They made look good in front of my wife. Met with Alex (marketing manager) upon arrival to confirm that all my request were in place. The breakfast buffet is worth the money they had so much variety of foods. And let me talk about the view it amazing. Cleanning service very professional, I can go on and on about this place trust me you will not be disappointed. Perfect hotel for your vacation in Phuket. Convenient shuttle to patong, nice breakfast and amazing view. I chose the ocean view pool room and was extremely pleased with my decision, except for the fact that while in the pool my view was the roof of other villas. The hotel grounds are well kept, my room was clean, the staff was pleasant for the most part besides on receptionist at the villa front desk. The shuttle was useful both on the premises and the one that goes into town. I took advantage of the hotel happy hour every night, the drinks were decent and so were the tapas. The room service not so much and was very pricey. I didn’t enjoy that food. There was a wide selection for breakfast and the food was ok. The best part of the hotel was the room and over all atmosphere of the property. You feel like you are in a luxe space and the views are absolutely phenomenal. This was a solo trip for me and my room was the highlight. I would stay here again and just eat off of the resort. This hotel is new and in very good condition. The rooms get very cold with the air conditioning. It is a challenge moving around the property but to assist you can call for a car to take you from your room to the lower lobby to catch a taxi or you can sign up for the shuttle to take you to a couple of the tourist spots. However do plan on a work out. The rooms with a pool are awesome! We stayed here on our honeymoon for 2 nights. We got a good deal on the room, which was great. However, our view was of another hotel unit, so if I went here again, I'd request a different view. Although, I know the rooms with the ocean view are more expensive, and we were on a budget. This was a very nice hotel. We were blown away by the views from the hotel pool and bar areas. It was magnificent. The breakfast was good and there was a lot of variety. We also liked the food we had at the pool bar. We really loved the pool bar (and the view)! Our room was very nice, as was the private pool. I liked the big shower, too. We stayed in the "M" building, so it was quite a hike from the main floor, it probably took us 10 mins to get to our room. Not a big deal for us, but something to mention for people with mobility issues, maybe. It was a short taxi ride away from Patong, but far away enough from the craziness to relax, too. I would stay here again, and would recommend. Next time, we would ask for a better view, though. Fantastic, from breakfast buffet to comfortable room with pool and sea view is magical and romantic. Extremely beautiful hotel and resort grounds, loved the pools and fitness center, well kept and clean rooms. Staff was super friendly and attentive. We loved our time here!! Take advantage of the free shuttle service into town (as the resort is ten minutes outside of the city of Patong), especially because food at the hotel was fine, but not stellar, in our opinion. For the price of the food (and the service charges that accompany them), we thought it better to go into town where you can find great food at a fraction of the price. However, this is one tiny, tiny downside to an otherwise EXCELLENT stay. Highly recommend this place! Wyndham Grand Phuket Kalim Bay places you within a mile (2 km) of popular attractions like Kamala Beach and Tsunami Memorial. This 194-room, 5-star hotel has 2 outdoor pools along with a full-service spa and a restaurant. Enjoy a bite to eat at Latitude 98, the hotel's onsite restaurant. Order from 24-hour room service to satisfy your hunger without leaving your room. Start each morning with buffet breakfast, available for a fee from 6:30 AM to 10:30 AM. Guests can expect to find free WiFi and 32-inch an LED TV with cable channels. The bathroom offers hair dryers, free toiletries, slippers, and bathrobes. Other standard amenities include a balcony, a sitting area, and a minibar. Guests of Wyndham Grand Phuket Kalim Bay have access to a full-service spa, 2 outdoor pools, and a fitness center. There's free parking and a free area shuttle. Multilingual staff at the 24-hour front desk can assist with tours or tickets, luggage storage, and dry cleaning/laundry. Other amenities at this luxury hotel include a sauna, free WiFi in public areas, and conference space. Dear Valued guest, It is a pleasure to learn that you have enjoyed your recent staying with us and thank you for kind word "Perfect hotel for your vacation in Phuket". 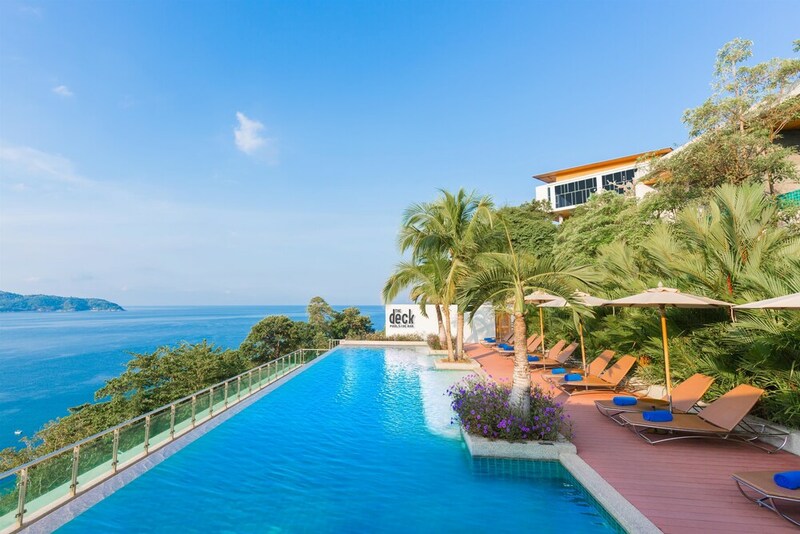 Most tourists stay at the more popular Phuket beaches, so it is great to discover that you decided to avoid the crowds and stay at our Wyndham Grand Phuket Kalim Bay where our amazing location set on Kalim Hill our buildings are set in lush greenery with beautiful views over the Andaman Sea. Closed to Patong, giving a tourist attraction with happending, approx. 5-10 minute drive. Glad that you had a great time and start the day with our breakfast buffet from Latitude 98 Restaurant with amazing sea view. We look forward to have you with us and once again to earn your endorsement. With appreciation, Guest Experience & Quality Manager and the team. Latitude 98 - Ocean-view restaurant specializing in international cuisine. Open for breakfast, lunch, and dinner. The Deck Pool Side Bar - Poolside rooftop bar specializing in international cuisine. Open daily for lunch. Infiniti Lobby Bar - Ocean-view bar specializing in international cuisine. Open daily. Thabtim Cafe - Poolside Cafe and bar specializing in international cuisine. Open for lunch. 2 outdoor swimming pools are on site, and the hotel also has a sauna and a fitness center. The preferred airport is Phuket (HKT-Phuket Intl. ): 44-min drive, 15.9 mi/25.6 km.